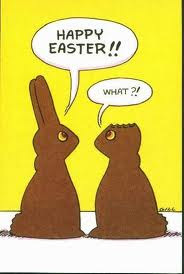 A belated Happy Easter to you all! We had gorgeous weather here in the mid-Atlantic, perfect for egg hunts and pretty Spring dresses. Jeffrey and I sang for two church services (never a day off!) in the morning then spent the day with my family before bouncing off to a final service at my church. It was a really lovely day, quintessentially Easter in season and spirit. I woke up to a visit from the Easter Bunny. My basket was thoughtfully packed with quality jerky products from Fresh Market. There was also a chocolate marshmallow bunny and a few eggs with candy inside. I stuffed the eggs in my purse and dispersed them among fellow choir members. Between services the nice church ladies had provided us all with breakfast. J and I chowed down on sausage links and eggs, choosing to sidestep the biscuits and pastries. I did grab a cup of fruit, but honestly didn't need it. Those green melon balls just looked so enticing. Back home we munched on appetizers which included shrimp cocktail and my Red Pepper and Walnut Dip served on cucumber slices. Then it was in to the kitchen for some last minute food prep. We cooked up Moroccan Lamb meatballs from Jen's Gone Paleo. I served these at last month's birthday party and they were SO good. Pretty dang easy too, try em. While the lamb cooked in the oven I prepared two more veggie dishes that would be good for J and myself but also provide some variety for big brother's vegetarian gf. Mom said there were too many food guidelines to adhere to and just made what she knew: ham (win! ), roasted potatoes (not a temptation for me at all) , squash casserole (I allowed myself a few bites of this carby creation but regretted them, it's no longer the tasty dish I remember loving), rolls (didn't give them a second glance), and a mixed pea salad (simple, good). So all in all I behaved myself. Mom also baked up desserts: Bunny Cake and Lemon Meringue Pie. I've mentioned mom's traditional Easter dessert on here before. She's been making one every year since I was little. Bunny Cake is strawberry cake covered in store-bought vanilla icing topped with sweetened, shredded coconut. It's in the shape of a bunny rabbit and he has pink ears, sits on a bed of coconut "grass" and will sometimes have gumdrop flowers blooming around him. He's cute, his cloyingly sweet, he's tradition. I submitted to tradition. It was unintentional. I just wanted to nibble his cute rabbit's foot. But for some reason it didn't stop there and at breakfast this morning I ate his ear off (call me Mike Tyson). I had evaded the gorgeous pie mom baked as well. But once you've tasted the bunny you might as well have a forkful of pie, right? So I did. And, well damn, may as well sliver off some of that moist and gorgeous Triple Berry Pound Cake. Part of me (the mid-senseless-binge par) reasoned that it was a major holiday and I deserved to enjoy these rare treats. A more rational side screamed *THIS TASTES BLAND, WHY ARE YOU EATING IT* Hand and fork did not hear the screams. A bloated belly and mild self-loathing is now my punishment. Jeffrey has been so good since adopting Paleo/Primal eating. I'm crazy proud of him. He passes up yummy treats all of the time. Here I am, the girl that dragged him in to this lifestyle, shoving processed crap down my gullet. And the worst of it is: it wasn't worth it. If I'm going to cheat it should be over a slice of cheesecake in a restaurant with my girlfriends. Not late night ice cream when all I meant to get from the kitchen was water. No longer living alone has made it harder, but I can't blame anyone else. I feed myself, I make the choices. Plus, it's no fun feeling out of control or guilty. And again, I can't stress it enough, the cheat food has yet to be worth it (except that one time we split my favorite custard sundae. So.Worth.It) I simply won't go around touting the wonders of clean eating and encouraging weight loss amongst the people I love while I stall my own progress with SAD crap. I'm working to hard to sabotage myself. Hi Eimear, congrats on going Paleo/Primal! Your meals look fantastically yummy. Let's wipe the chocolate off of our mouths, drink some water and hop back on track. It's kind of awesome how are bodies are loudly telling us that these cheats are effecting it in a less than lovely way. It's great motivation to stay on path.